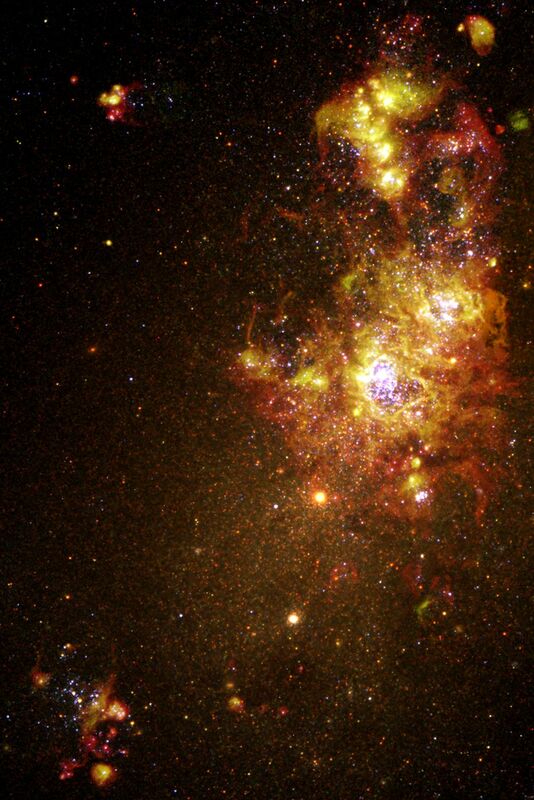 Newly released images obtained with Hubble Space Telescope in July 1997 reveal episodes of star formation that are occurring across the face of the nearby galaxy NGC 4214. Located some 13 million light-years from Earth, NGC 4214 is currently forming clusters of new stars from its interstellar gas and dust. In the Hubble image, we can see a sequence of steps in the formation and evolution of stars and star clusters. The picture was created from exposures taken in several color filters with Hubble's Wide Field Planetary Camera 2. NGC 4214 contains a multitude of faint stars covering most of the frame, but the picture is dominated by filigreed clouds of glowing gas surrounding bright stellar clusters. The youngest of these star clusters are located at the lower right of the picture, where they appear as about half a dozen bright clumps of glowing gas. Each cloud fluoresces because of the strong ultraviolet light emitted from the embedded young stars, which have formed within them due to gravitational collapse of the gas. Young, hot stars have a whitish to bluish color in the Hubble image, because of their high surface temperatures, ranging from 10,000 up to about 50,000 degrees Celsius. 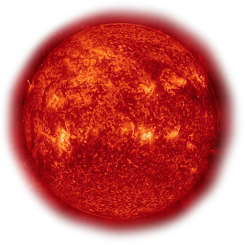 In addition to pouring out ultraviolet light, these hot stars eject fast "stellar winds," moving at thousands of kilometers per second, which plow out into the surrounding gas. The radiation and wind forces from the young stars literally blow bubbles in the gas. Over millions of years, the bubbles increase in size as the stars inside them grow older. Moving to the lower left from the youngest clusters, we find an older star cluster, around which a gas bubble has inflated to the point that there is an obvious cavity around the central cluster. The most spectacular feature in the Hubble picture lies near the center of NGC 4214. This object is a cluster of hundreds of massive blue stars, each of them more than 10,000 times brighter than our own Sun. A vast heart-shaped bubble, inflated by the combined stellar winds and radiation pressure, surrounds the cluster. The expansion of the bubble is augmented as the most massive stars in the center reach the ends of their lives and explode as supernovae. Deprived of gas, the cluster at the center of NGC 4214 will be unable to form further new stars, and its luminous stars will continue to go supernova and disappear. Elsewhere in the galaxy, however, gas will start to collapse and form yet another new generation of stars, even as the clusters visible today gradually fade away. The faint stars covering most of the picture are much older than the bright blue supergiants, and show us that episodes of star birth have been occurring in NGC 4214 for billions of years.